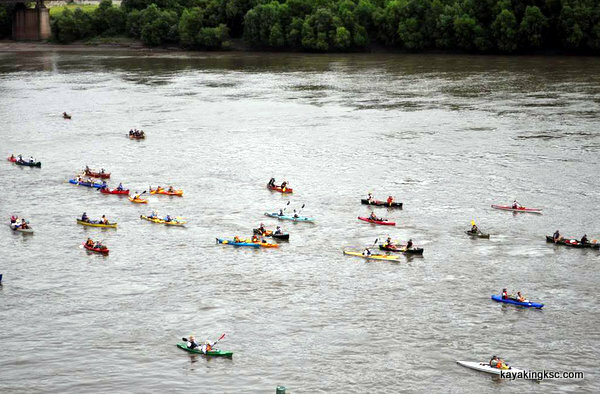 MR340 kayak race mistakes (personal and observed) or termed another way "Lessons Learned"
Worlds longest non stop river kayak/canoe race at the height of the mid-west summer......What could possibly go wrong? 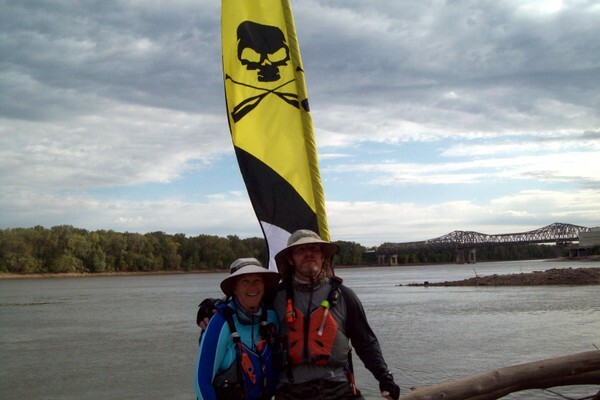 Well we have completed three of the Missouri River MR340 races & preparing for another go at the muddy river. Okay so there is a "Slight addiction" to this adventure. This page is dedicated to helping paddlers avoid the common MR340 mistakes that prevent them from reaching the finish line in 88 hours. 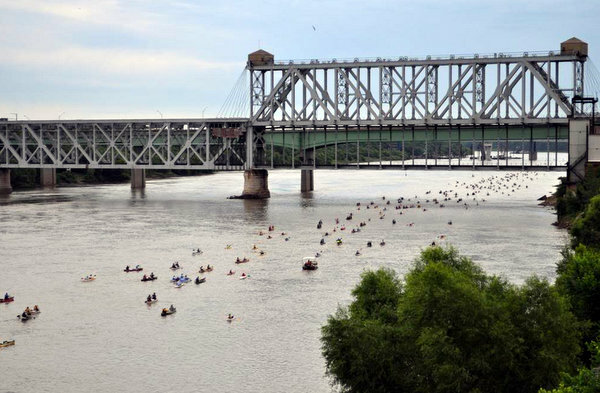 People look at me like I am crazy when I say, "No, no, not 34 miles, 340 miles"
I would like to point out a misconception--One does not have to be an Olympiad or Navy seal to compete in & complete in the MR340 Missouri River race. **There is no upper age limit. **There is no weight limit-very large people in canoes beat our last time by 24 hours. **Veterans missing limbs have used peddle powered Kayaks to be our times. **A friend of mine on an SUP beat our times by two days---but he might be an ex-navy seal-special-forces-better-shape-than-I-have-ever-been type person. Excitement at Kansas City waiting for the race to start. **Paddle partner quit or did not even show up. **Wind: One year the winds were so strong, that supper athletes in their supper-skinny watercraft could not stay upright. **The heat, the heat and the heat. (Think it was 97 in the afternoons, on the last race) -Heat and the dehydration that goes along with the heat. **Blisters. The race forum has horrifying blister photos. **And of multitude of other reasons: sunburn, equipment failure, storms, sleep deprivation, muscle injuries & simple exhaustion. I was recently reading race/pace data from the most studied foot race on the planet--The Boston Marathon. 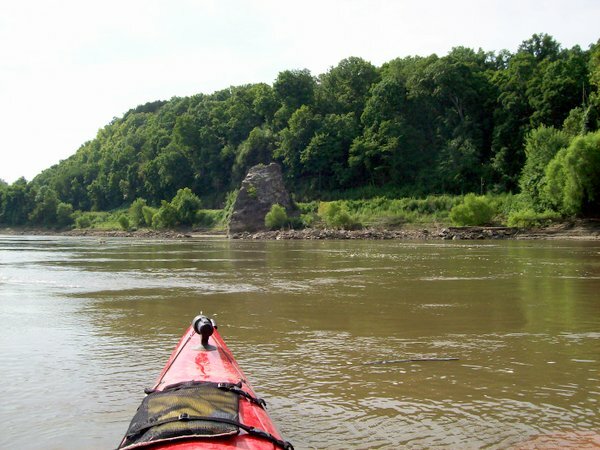 I placed the data from long distance running on to the challenges of long distance paddling and realized why my first MR340 race was almost a disaster! However, running the first mile more than 6% faster than your normal race pace considerably reduces performance; so much so that almost all the racers that ran faster than their 6% normal pace FAILED to even finish the race. This is possibly the unforeseen reason of why so many very prepared MR340 racers get the DNF "Did not finish" Paddling too fast! A Lesson from my first MR340 race. Pre-dawn hours into grudging daylight on the river in Kansas City & an incredible, beautiful, (dangerous?) summer 'cloud to cloud' lightning storm blown in off of the great plains & had the race start time delayed by an hour. Excitement was palpable as racers in a vast assortment of boats waited to begin the 340 mile race. Many like myself were first timers while others were veteran racers that I would only see at the start and perhaps with boat loaded on vehicles at the finish line. I of course had full confidence I would make it to the finish line. Who would enter the race with other expectations-of course this belief collided with the fact that one third of the approximately 300 boats would drop out of the race. “DNF” (Did not Finish” on the official race roster. I had studied last year’s roster noting the plethora of DNF with some trepidation and of course awe at the paddlers who had finished in heroic superhuman times. 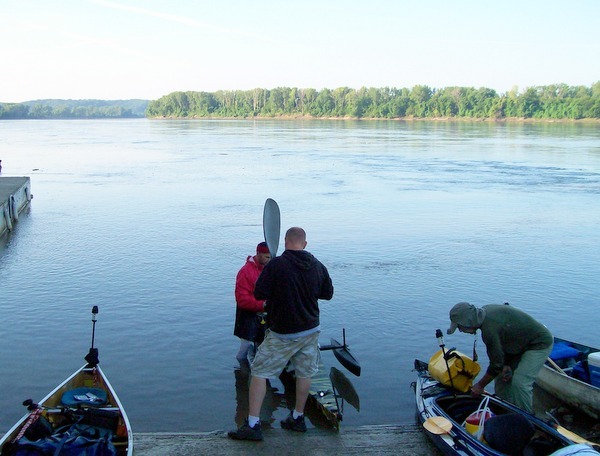 The brass cannon fired off and 300 boats bumped and banged from the slack waters of the Kansas River to the muddy & somewhat intimidating Missouri River. 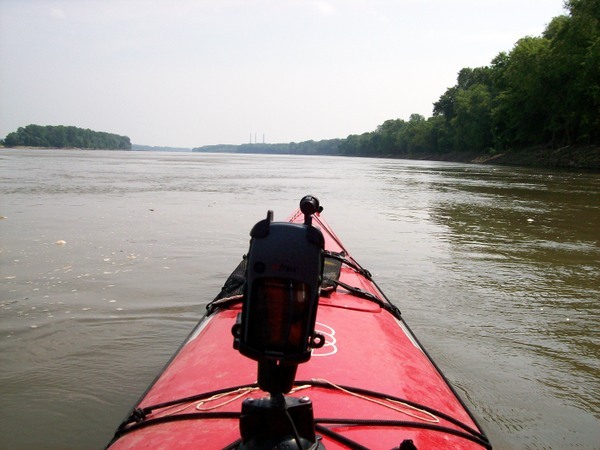 The carbon fiber boats with the highly trained athletes quickly-almost immediately -some at human powered speeds of 14 miles per hour disappeared down river towards St. Louis as if they never existed. Me in the QCC700 (in the upper right side of the photo) passing all the slower boats-a mistake I would pay for later in the day. What remained was an assortment of canoes, broad plastic, sleek homemade wooden craft and expedition kayaks. Slow but steady. I was not immune to the race excitement! And as we swept under the bridges of Kansas City, I quickly passed most canoes and slower kayaks. The QCC700 easily placed me into the second tier of racers-not the Olympiads or Navy Seals types- but never the less fast (in my opinion anyway) 8.5 mph is what my GPS was reading. 12 mph was only a brief moment to see what my top speed could be. For the most part I was paddling 1.5 to 2 & sometimes 3 miles per hour faster than my normal training speed and loving it! I did a lot of drafting behind other larger multi-paddler boats for energy free motion--had a lot of conversations with the folks I was drafting behind. Reached check point one by 1 pm and continued on towards check point two & three. When the afternoon heat finally brazed the Midwest- I had slowed down. The heat bumped up to 96+ and I started to fade. Not having fun anymore and lots of paddlers that I had blazed by in the morning passed me. Some of these paddlers giving me scary looks of concern. To tell you the truth, I was fairly miserable. My wife and brother were a the boat ramp & I began to talk about the next leg towards Miami. However they both insisted I was rambling incoherently and said I was spending the night at Waverly and could get a early start in the morning. Actually it did not take much persuasion for me to quit for the day & I took a much needed rest. Note: the next three days were hot but fun and I did not again experience that level of exhaustion. "Of misery"
It wasn't until ten years later that I read the Boston Marathon pace data that a light bulb went off in my head and I said "Oh"
Note about Waverly: The next morning, long before daylight I launched from the Waverly boat ramp. To my dismay there were only two or three people still at Waverly--and they might have already dropped out. At the mandatory safety briefing given by Scott the organizer, he stresses---stresses-DO NOT spend the night at Waverly. He has seen too many paddlers get too far behind by stopping at Waverly. Scott will tell you to push on to Hills Island or even crowded Miami. My first MR? Even though I was forced to stop at Waverly, the QCC700 easily caught up to the back of the pack and pushed to the middle. What a boat -QCC700---excellent water craft! Even without knowing the scientific study, my wife wisely insisted on slow starting paces the next two races. Have to admit-it was difficult to slow down with race adrenalin pumping however the MR340 for most normal people is a race to finish, not necessarily a race to beat the other racers. Note on finish times: Nearly everyone who does not drop out for various reasons completes the race without requiring the full 88 hours allotted. (I think we are some of the foolish few--who plan on using the full time allotted, because...I had set a goal for myself that I would sleep at least four hours a night and ideally, five to six hours sleep time. The folks who beat us so handily might have given up a nights sleep. 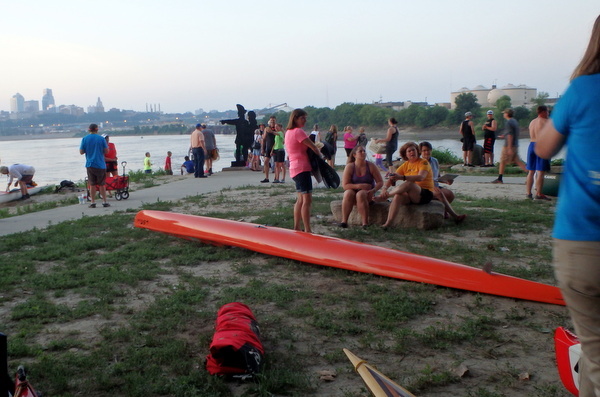 Of course night on the Missouri river is an awesome experience. The lesson from this long winded page? Slow Down! 340 long miles await you.